Whether they’re short or long, people love checklists. They’re easy to scan through, and can be valuable to the reader if the information is relevant and accurate. Go back to some of your evergreen articles that share the same topics, and create a checklist. Try to have at least five items, but not more than ten. After ten bullet points, people tend to lose interest in the material. Readers are also more likely to share checklists via social media. Fact: 76% of blog traffic to Hubspot is contributed to readers viewing older posts. Tip: Always link back to the original articles as reference points for your checklist. This will encourage readers to go back and review the older material, and is especially helpful for new visitors to your site. Seasonal articles are always a hit to recirculate on social platforms or blog sites. You can call them throwbacks, or whatever you like. Take the original content and add a new twist to it. Perhaps a product has been updated since that time, or you offer a new seasonal service that pairs well with the article. Don’t worry about current readers and content redundancy. By the time the holiday rolls around again, they will have already forgotten what you wrote, and you’ll have new readers that have yet to peruse the articles. Fact: Percentage of moms who depend on technology to plan for birthdays, holidays and other special occasions: 53%. Tip: Seasonal articles include holidays too. Use the recycled content to promote holiday sales, in addition to reviving older materials. Some of the content that you produce will need to be updated-whether it’s facts or other data, as information changes in certain niches almost daily. Check your archives and see where you can update and improve content, and repost that information for your readers. Use different colors or sections to highlight the updates and let readers know exactly what’s changed. Many bloggers and companies do this, and customers appreciate a website that takes the time to update their stats and data to remain relevant. Fact: Companies that regularly blog see an average of over 50% more traffic to their site. Tip: Always use reputable sources when adding new facts and data in your posts. Follow trusted industry blogs and websites, and check often for updates to your topic. You can rest assured that old and new readers will welcome viewing your articles in a new perspective. Infographics are an efficient and engaging approach to this. Take the information in the article and find ways to incorporate stats and other facts. Catchy visuals and numbers will keep your readers interested, and help them to retain the information that you’re presenting. Infographics are also shared more often than basic articles and blog posts. Fact: 65% of people consider themselves visual learners. Tip: Give readers the option to embed your infographic into their website. Whether it’s an explainer video, or a short commercial, using video to engage your customers is a no brainer. 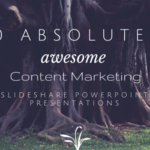 When looking back at old content, extract the main points to highlight in your presentation. Write short explanations and make sure that you stick to the point. Your video script should be no longer than three minutes, or you risk the viewer getting antsy and clicking away. Compiling information from several pieces of content would also work with a video, specifically an educational piece about a product or service. Fact: Search results for video average a 41% higher click through rate than plain text. Tip: You don’t have to tape footage to produce an effective video. Images, text and animation can be produced right on your computer, and is just as powerful as actual footage. Some customers may not visit your website for daily updates, but they will take the time to read an email newsletter. Use old articles and content to fill portions of your newsletters. Insert a throwback area of the newsletter that features pertinent information that you’ve published before. The main thing to remember here is that the recycled content should always add value. Tip: Your newsletter doesn’t need to be fancy. There are thousands of free templates available online. Create a free eBook using older material, and throw in some fresh content as well. Readers will appreciate having all of the related material in one area, as opposed to having to search your site by tags and titles. Promote the book on the sidebar of your site, and in any marketing materials that you normally produce for the public. You could even sell the publication on sites like Amazon. Make sure that the information is top notch, and add plenty of pics and graphics to break up the sea of words. Fact: Women are more likely to read books on electronic devices than men are. Tip: EBooks don’t have to be long, but 3000-5000 words should be your minimum word count. Podcasts have become very popular over the years, and gives business owners a powerful platform for marketing. You could use older material to find topics to discuss, or to give out stats and facts to listeners. To make the show interesting, ask listeners to visit your site and review the material before listening. Tell them what the topic of the show will be, and create a big buzz about reviewing the materials and discussing it live. Fact: There are more than 1 billion podcast subscribers to iTunes. Tip: If you’re new to podcasting, look for a free host before you dive into a paid account. The moment you create an original piece of content, you’re ultimately producing material several times over because of the ability to update and represent that same information. Aside from the tips listed here, be creative in using older material, and don’t be afraid of running customers away with redundant content. The key is to update what you already have and present it in a new fashion. Never repost anything word for word, and always look for a new angle. If you get this right, you’ll find that there’s an endless supply of content already in your possession, and content creation will get a bit easier as you go along.